* Specialized course options vary by month and may include one or more of the following. Not all topics are offered every month. 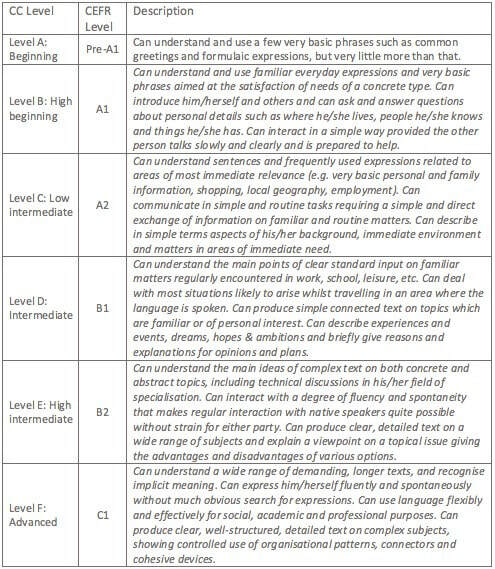 CC levels are roughly equivalent to Common European Framework of Reference (CEFR) levels as shown in the chart on the right. Descriptions in italics are taken from the “CEFR Global Scale” (http://www.coe.int/t/DG4/Portfolio/?M=/main_pages/levels.html).